MOSCOW, November 25. /TASS/. 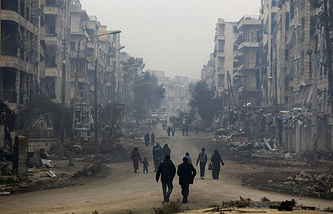 Russian military experts in chemical protection arrived in the city of Aleppo hours after militants launched a chlorine attack on residential districts of the city, the Russian Defense Ministry’s spokesman, Maj. Gen. Igor Konashenkov, told reporters on Sunday. "Groups of specialists from units of nuclear, chemical and biological warfare protection deployed at observation posts in Syria urgently arrived to the area of the attack, carrying special equipment with them. They are working with the injured in hospitals, and monitor the environment in the area where toxic substances were used by militants," he said. "According to initial information, confirmed, among other things, by symptoms diagnosed in those affected, the projectiles launched at residential districts of Aleppo were filled with chlorine," the Russian general added. The official went on to say that the Russian side has earlier reported that the organization known as White Helmets was preparing to organize chemical provocations in the demilitarized zone around Idlib in order to accuse the government troops of using chemical weapons against civilians. "It is quite evident that the White Helmets have direct ties to terrorist organizations operating in Syria, in particular in the Idlib de-escalation zone," he said. The general also said that "Russian specialists closely monitor the situation around the Idlib de-escalation zone, which is the zone of responsibility of the Turkish side, in line with agreements." "The Russian side is set to discuss this incident with the Turkish side, which is the guarantor of the armed opposition's cessation of hostilities in the Idlib de-escalation zone," Konashenkov said. The Russian Defense Ministry spokesman said that, according to information obtained by the Russian Center for reconciliation of the opposing sides in Syria, terrorist groups located in the Idlib de-escalation zone opened fire at northwestern districts of Aleppo at 21:50 Moscow time on Saturday. Mortar rounds, filled with toxic substances, presumably chlorine, landed on the Nil Street in the Al-Khalidiyah neighborhood. The projectiles were fired from positions in the southeastern section of the Idlib demilitarized zone, near the town of Al-Buraikat, controlled by militants of the Hay'at Tahrir al-Sham group (formerly Jabhat Al-Nusra, outlawed in Russia). 120-mm mortars were used in the attack. "As a result of the shelling, 46 people, including eight children, suffered from exposure to a toxic agent. All victims were taken to hospitals in Aleppo, where they received medical assistance," Konashenkov said. 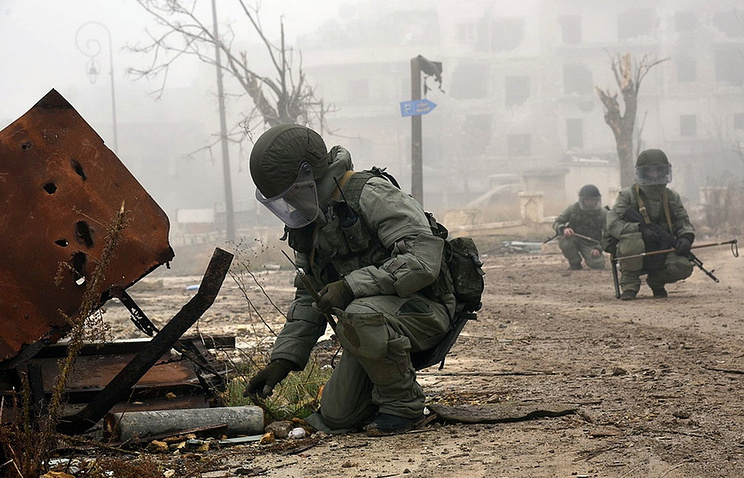 Earlier, the spokesman said that six special vehicles of Russia’s nuclear, chemical and biological warfare protection forces were deployed at Russian posts in the immediate vicinity of the Idlib demilitarized zone to regularly monitor the situation there.